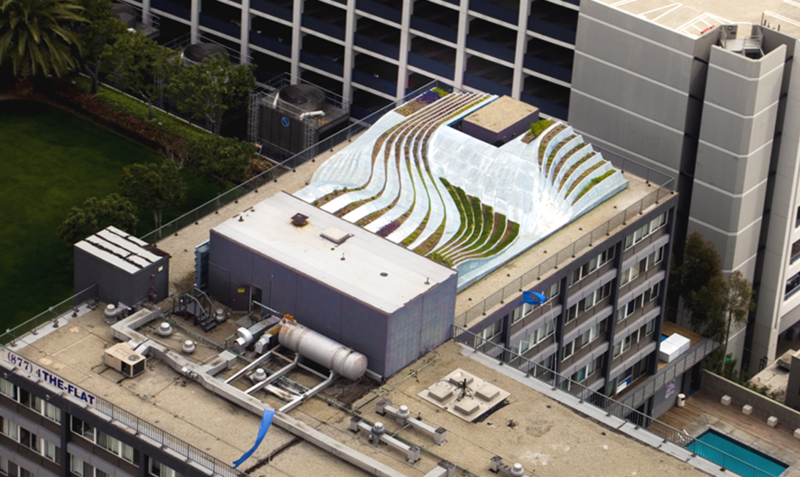 SYNTHetiscapes is a sustainable initiative investigating the development of adaptable structures able to fulfill Green Roof requirements by weaving physical and biological processes into a self-sufficient ecosystem. 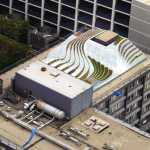 The project is located on top of The Flat, a residential development in downtown Los Angeles combining rental units with an dynamic public programming and a ground floor restaurant. 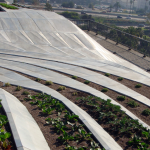 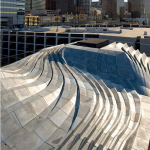 The Rooftop Garden consists of a suspended corrugated metal blanket forming a series of green channels or plow lines. 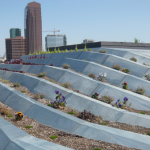 An alternating series of hard and soft surface treatments weave together a fertile ground for the production of edible species and a unique series of platforms and seating spaces overlooking the downtown skyline to the east and the extensive Los Angeles horizon towards the south. 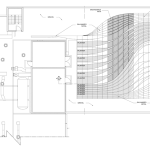 Each plow-line channel accommodates an engineered growth medium, much less dense than natural soil in order to minimize dead loads, and an automatic drip irrigation system.